Most everyone thinks of blood platelets as being responsible for blood clotting after injury, which is true. What many people do not know is that blood platelets serve two other important functions. Blood platelets are responsible for bringing white blood cells to the injured area to cleanup the remains of dead and injured cells. Most importantly to the regenerative discussion, blood platelets release growth factors that are directly responsible for tissue regeneration. These substances are called cytokines and they contain platelet derived growth factor epithelial growth factor, and other important growth factors. PRP has been used for many years in surgical centers around the U.S. and abroad to improve the success of bone grafting (especially after dental surgery) and by cosmetic surgeons to speed healing time and decrease the risk of infection after surgery. Only recently have doctors been experimenting with injecting PRP for the treatment of chronic pain. 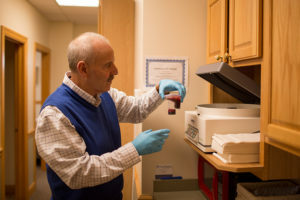 Successful reports have been made in the treatment of tennis elbow, plantar fasciitis, Achilles tendonitis/tendonosis, rotator cuff tears, meniscal tears, osteoarthritis and chronic low back and neck pain with the injection of PRP with the goal of regenerating degenerated connective tissue. A PRP treatment is as follows: a patient’s blood is drawn and placed into a special collection kit. Using the person’s own blood eliminates the risk of blood-bourne disease transmission. The kit is placed in a centrifuge for 15 minutes and the platelets and plasma are separated from the red and white blood cells. Two-thirds of the plasma is removed and discarded and the remaining plasma is mixed with the platelets. This higher than normal concentration of platelets is what gives us Platelet Rich Plasma. The PRP is drawn into a syringe. The area to be treated is injected with local anesthetic and after waiting five minutes for the anesthesia to take affect, the PRP is injected. The injection technique is identical to Prolotherapy, only the solution injected is different for PRP.